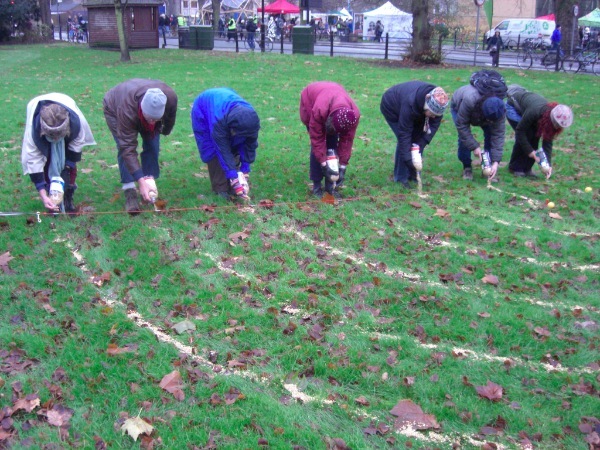 Here are some photos of the process of making an outdoor ‘corn’ labyrinth on grass. The pictures were taken at Mill Road Winter Fair and the ‘aerial view’ one is from the Quiet Waters Christian Retreat House in Suffolk. 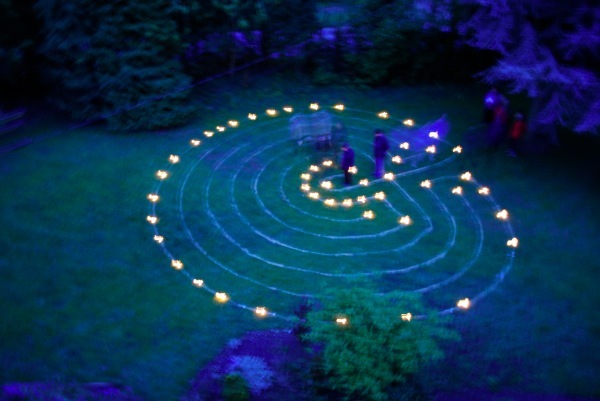 This method is for making a seven circuit classical (or Cretan) labyrinth. The corn is the kind of ‘mixed corn’ you feed to chickens, and one large sack is just sufficient, providing you are not too generous at the start. The stake and swivel are the corkscrew-type dog owners use to tether their dog when at the beach or on a picnic. The rope we used is a 6 meter long dog-tether. 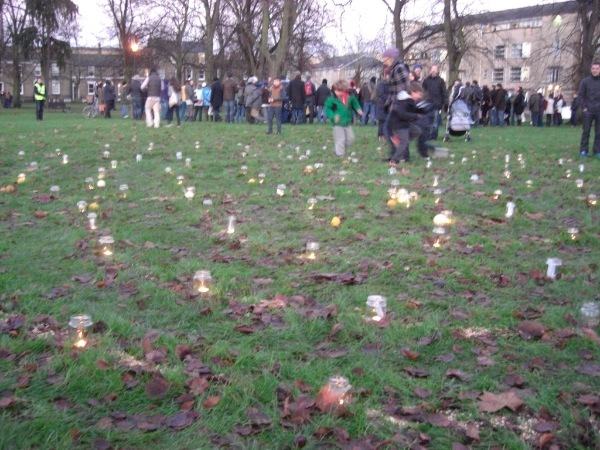 The path widths are 80cm and the diameter of the labyrinth at the widest point is 12 meters. Note, it is necessary to mark the four corners of the initial ‘seed diagram’ with tent pegs. 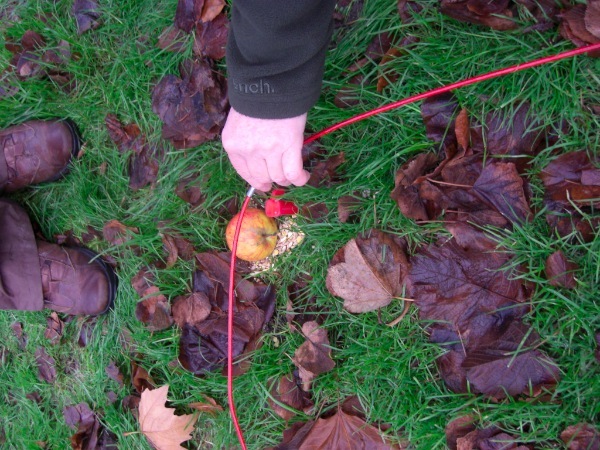 As the rope is drawn round, it snags on the pegs, thus producing a mushroom shape rather than a circle. Please check the Labyrinthos site for full instructions – I can confirm they work! 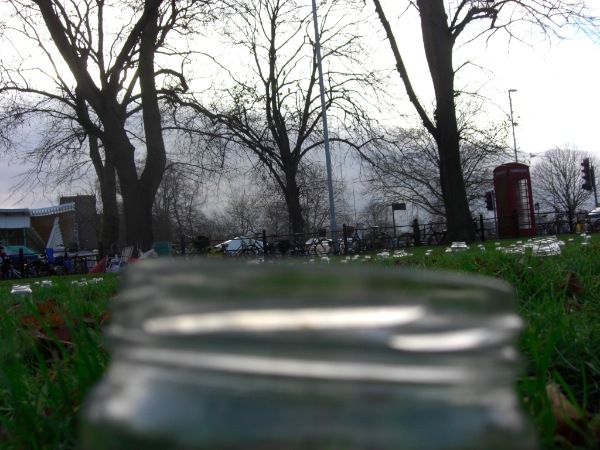 For the candlelit version of the labyrinth we used tea lights in jam jars. For a different effect, it is also possible to buy brown paper ‘candle bags’ and put some sand and a tea light in each one. 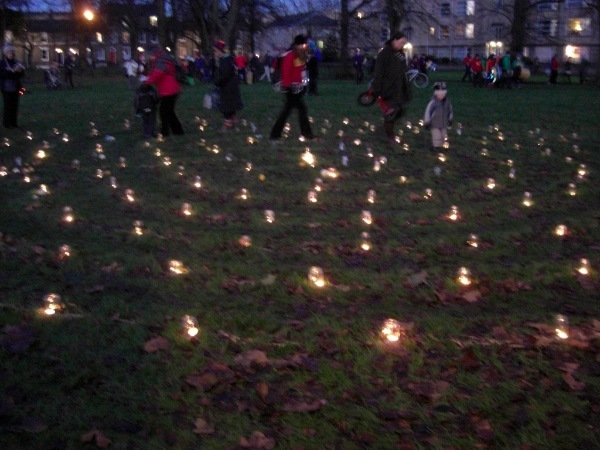 For our labyrinth, 12 meters in diameter, we used 180 jam jars and tea lights, with a spacing of 80cm. Finally, to calculate the length of the ‘walls’ of your labyrinth (more correctly known as the ‘fields’) the rule of thumb is to take the diameter and multiply it by 13.33. 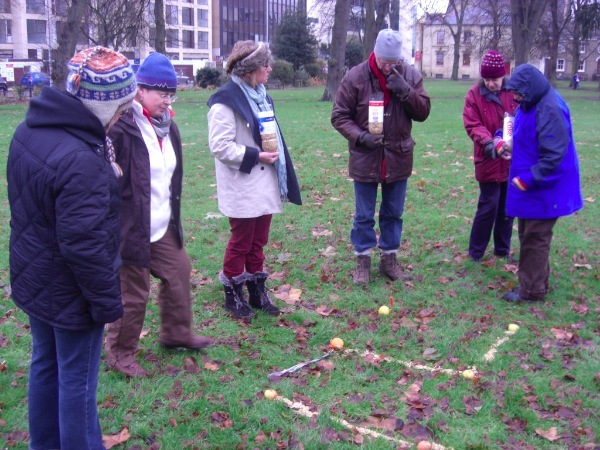 This entry was posted in Uncategorized and tagged calculating length of labyrinth 'walls', making a classical labyrinth, Mill Road WInter Fair, mixed corn, Quiet Waters Retreat House, rope and swivel.